There was a time when people always dressed in their ‘Sunday best’ whenever they ‘went to town’. 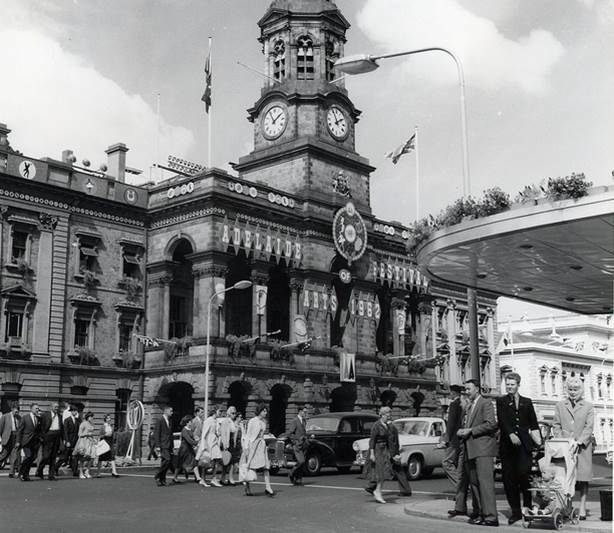 Here’s a photo (below) of the Adelaide Town Hall, taken in 1962, during the Festival of Arts and is from the State Library of South Australia’s collection on photostream. Photo from State Library of SA. Whenever we went to town in the 50s and 60s it was always in our Sunday best. The thing that strikes me about this photo is how well dressed everybody is, especially compared to today. I recall as a kid when my mother would go to town she always wore her Sunday best dress, including hat and gloves. That was in the 50’s but people still continued to dress well and men wore a suit and tie and women wore their best dresses if going to the city to shop or going out on a Saturday night right through the 60s. Even into the 70’s and 80’s people still dressed up to go to the pictures or a special event. I was walking through the city on my lunch break today and I think I saw 2 men in smart suits but not one woman in a hat and gloves. It was mostly jeans, in some cases torn and dirty jeans, and assorted clothing that we would probably not have worn to do the gardening in the 50’s and 60’s. What really bothers Merrilyn Greer is how no occasion is good enough to dress up for anymore. “I was at the ballet the other night and the majority of the audience was in jeans while 4 were in TRACKIES and UGGBOOTS! I was offended”! Jan Meyer recalled; “We never went out unless we had our best clothes on. I have fairly recently been to a wedding where people turned up in T-shirts and thongs. Ughh. I wouldn’t have let them in the door”. “Sadly, it’s that way all over the world now” posted Amy Lynn Yeager. “Personally, there’s a time for jeans and a time for getting dressed up & many people cannot discern between the two anymore. I love the styles of those bygone days, just love it”. And just finally Mihailo Stojanovski mused, “I think that the life style has changed due to the increasing omnipresent feeling that we must live in a casual way in this fast paced world of ours. Thus we’ve created a laid back thing that has spread into fashion. I see nothing wrong the way we now wear things. Different times, different lifestyle and that’s OK. It’s called progress. Who knows, in 100 years from now everyone will walk around naked, and laugh at us, or they would be nostalgic “OMG, look at them, they all wore clothes back in the day! How bizarre”!! So much has changed as far as clothing goes. Our wardrobes are bigger, filled with cheap items which last barely a season either through poor workmanship/materials or they just go out of fashion so quickly. Back in the 50’s, 60’s and even 70’s you saved to buy a quality piece. Clothing was more classic in design and you could mix and match. It’s possibly why we enjoyed dressing up to go out, we had the chance to wear that wonderful piece. My mother at 83yo still insists on ‘dressing’ up just to go and buy her bread and milk. She wouldn’t dare venture out in her house clothes. You might be right in your last couple of sentences of this story. It may well be an “evolutionary process” of Western Society returning back to cave person’s world – except maybe at a rapid pace & using it’s time of technology, etc. Maybe that’s why our past & current social norms are not coherent with words like respect, etc. And it’s MihaJlo Stojanovski. With a “J” 😀 Thanks for sharing my quote. I appreciate it.